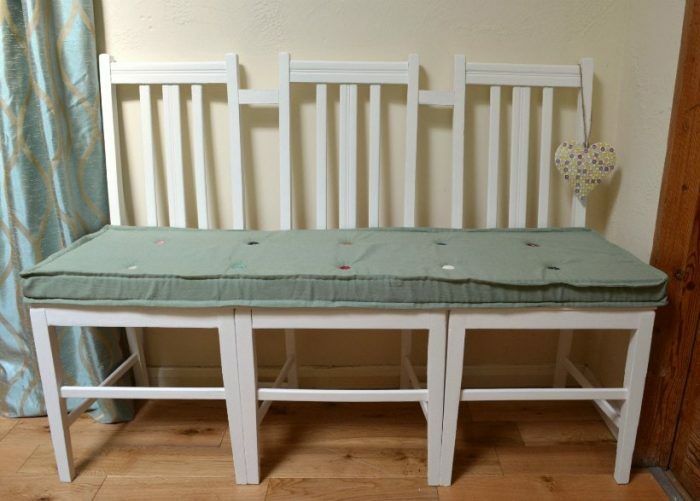 Revealing my entry for gumtree’s #upcyclerevolution – upcycled garden bench seat made from former dining room chairs:) The DIY bench seat could equally be at home in a hallway for putting on shoes, at a dining room table – lots of places!! 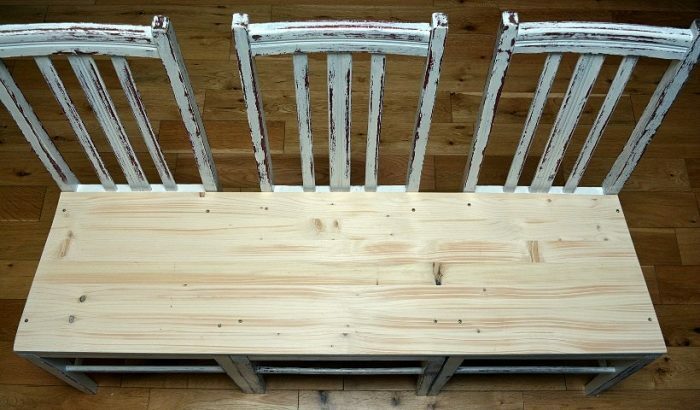 Whats not to love about upcycled furniture? 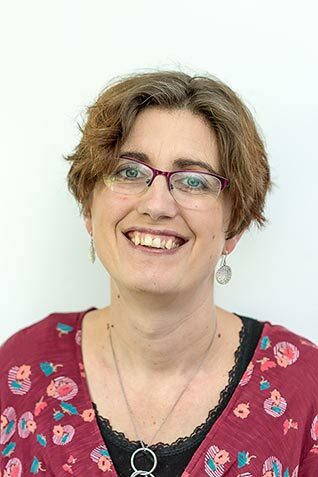 In case you are tempted to make your own version this how I made it, with considerable help from my husband – one quick disclaimer first we are not carpenters and there could very easily be a better way of doing this!! 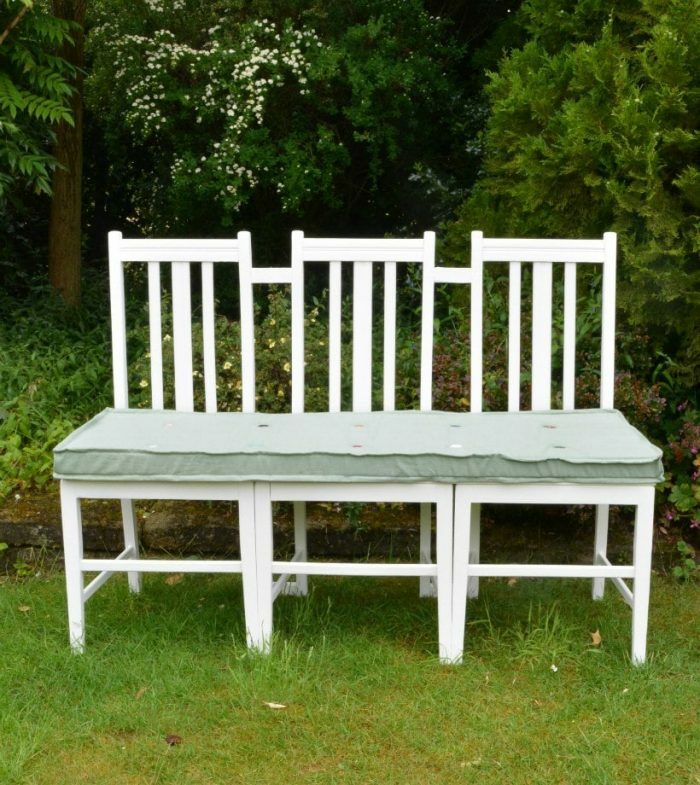 We started by sanding down the chairs and removing the seats – the chairs were very rickety, they just fell out! The chairs were placed together and the seating area measured. My husband cut wood to fit the seating area across the three chairs. I painted the sides of the seats and legs which will be joined together. 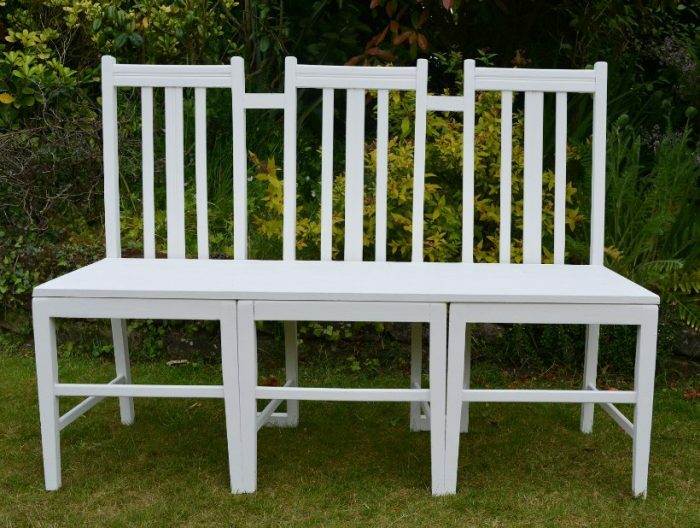 Use paint appropriate for your chosen location of finished bench. 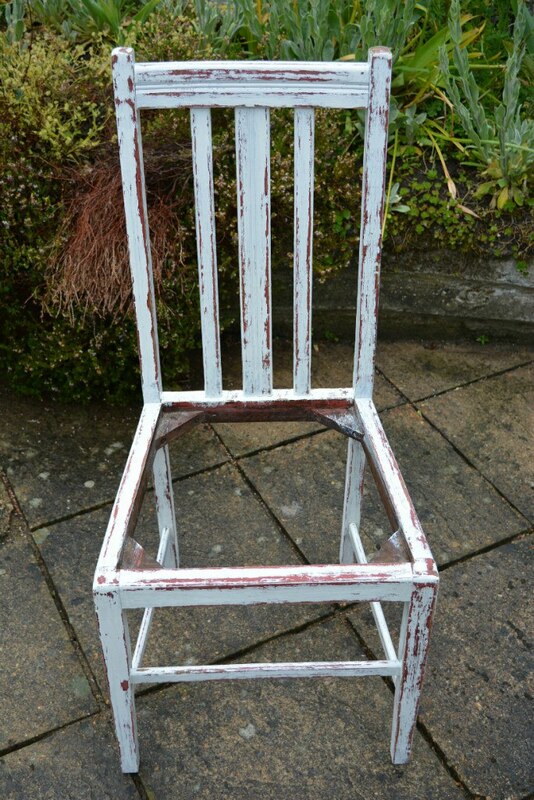 Starting off using spray gloss I quickly realised this was beyond budget and changed to using chalk paint (which I already had). This part of the chairs is hard to reach once assembled. Next my husband attached the seat, screwing into each corner of each chair. The front legs were screwed together at the base. The back of the chairs had battoning placed near the top, screwed into place. The same battoning was used at the base of the rear chair legs too. The bench was then painted with primer, followed by three coats of chalk paint. I had been fortunate to win some as a runner up in Rust-oleums Make it Yours monthly competition. The bench took far more paint than I expected, using two thirds of a 750ml tin. Finally the all important cushion. We are fortunate in Norwich to have a foam market stall – the foam cost £14, and then several charity shops later I sourced a great curtain perfect for upholstering the cushion. I followed a great tutorial to make the cushion cover. 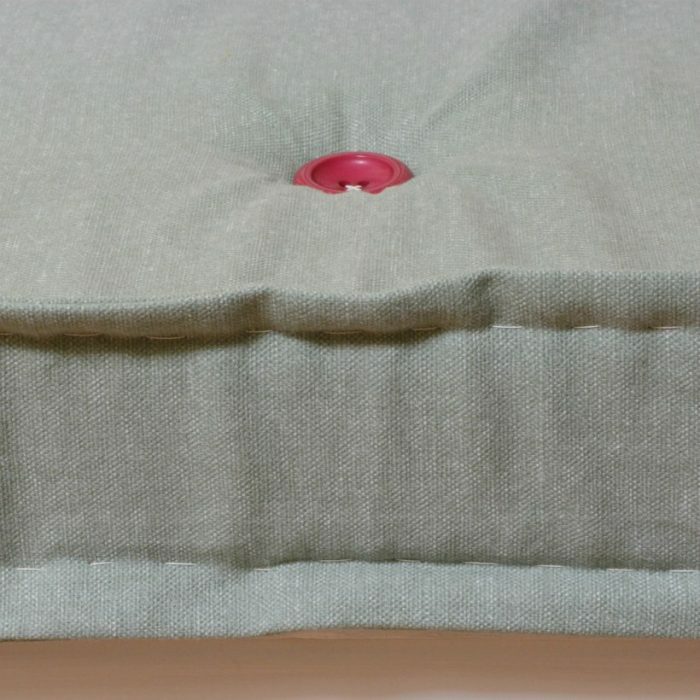 One of the biggest dilemmas was button choices, tempted by natural toning buttons I braved some bright colours instead. Would you choose toning coloured buttons or be brave and go bright?? 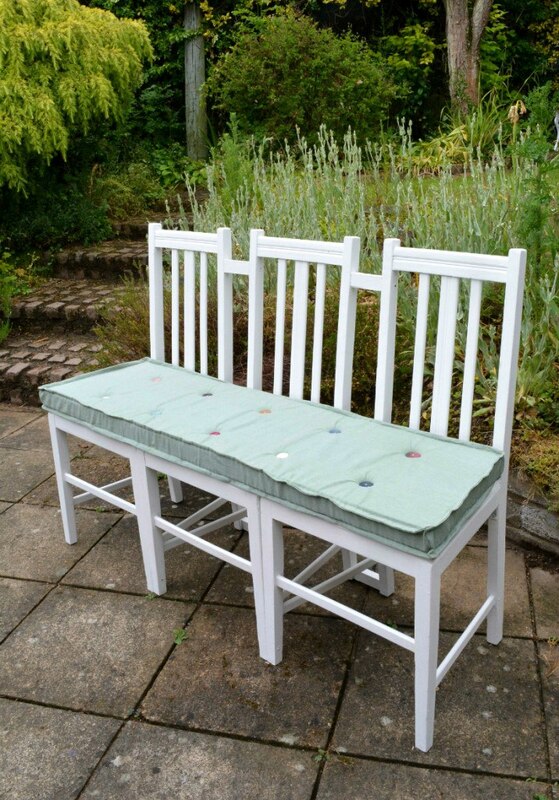 It looks fabulous Vicky, and such a great way to upcycle old chairs. Good luck with the competition. Love your new bench seat Vicky! What a great idea. I think you made the right choice going with the coloured buttons too. Good luck in the competition! Love the bright buttons, very modern. This is such a fun way to makeover furniture – love it! And good job on putting the proper bracing in the *right* places! Glad you went with the colour MIX of buttons. Ooh love the idea of yoga mats:) The time framework was quite tight which limited my ability to source other reycled materials. My husband is wondering how many seats could be made out of an old wardrobe rather than buying new wood. Love the bench and the bright colored buttons are perfect. Hope you win. I think you should. This is very clever. Good luck and thanks for sharing. Well done Vicky a perfect seat for a kitchen or could see in a hallway. Upcycling the way to go girl. I wish I had a hallway big enough:)!! Elsie Pop recently posted…My Sophie’s Universe is finished! What a great idea. I think the bright and varied colours of the buttons are the perfect finishing touch. I might have even chosen bright paint for the chairs! This looks great.